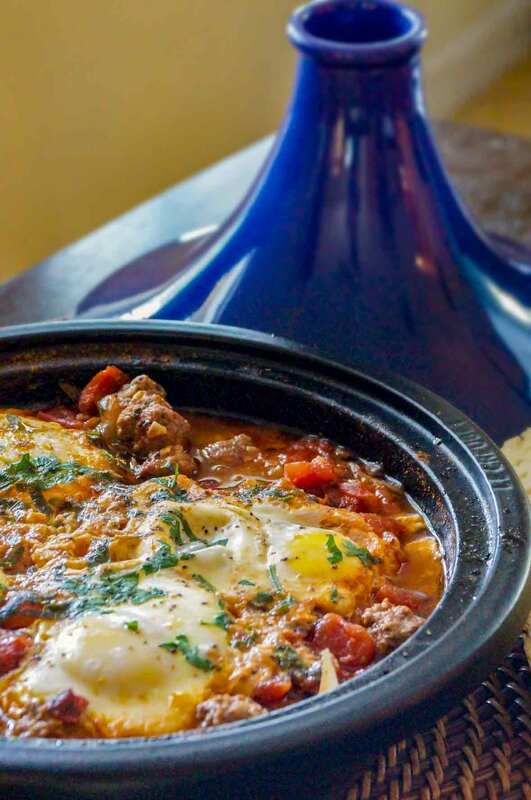 Kefta mkaouara, meatball-egg tagine, a Moroccan comfort food. Lamb meatballs are served in a cinnamon-flavored tomato sauce in which eggs are poached. Served straight from the pan, with hunks of bread? Now that’s the kind of rustic we like. One word of caution: Eating this way makes it terribly difficult to judge portion sizes. You may have to eat defensively to make sure you get your fair share. Forks at the ready, folks. 1. Combine the ground meat, grated onion, parsley, cilantro, cumin, cayenne, and salt and pepper. Wet your hands and form the mixture into 1-inch balls. 2. Heat the olive oil in a tagine, cazuela, or black iron skillet set over a flame tamer over medium heat. Saute the meatballs in the oil until well browned on all sides. Remove the meatballs from the pan to a dish. 3. To the same pan add the chopped onions, tomatoes, garlic, parsley, cumin, cinnamon, cayenne, and pepper. Cook uncovered for 30 minutes, or until the sauce has reduced to a thick gravy. 4. Add the meatballs back to sauce and simmer for 10 minutes. Carefully, break the eggs into the sauce and poach them for 5 minutes, or until set. 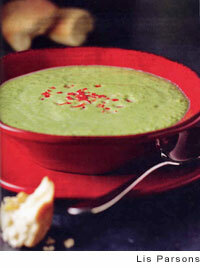 Serve at once, directly from the pan with chunks of dense, crusty bread. 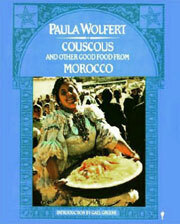 Kefta Mkaouara | Meatball-Tomato-Egg Tagine Recipe © 1973 Paula Wolfert. Photo © 2013 Tara's Multicultural Table. All rights reserved. All recipes and photos used with permission of the publisher. Had this last night and came out amazing. I did double the recipe which was perfect for 6 of us. So I would say that the recipe as written would work for 4 people and not 6. Instead of eating with bread I actually did with semolina which was really nice with the sauce. The flavors are intense, the meatballs juicy and the egg was indeed a nice compliment to this dish.